Bubble Burst info about the game-Games2Rule. Move your mouse to collect the same color bubbles. Click the mouse button to create a fusion. 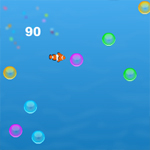 The more bubbles you stack at one time, the more points you�ll get. Don't touch bubbles of other colors, as the game will comes to end soon. The further you get, the harder it becomes, as the number of bubbles increases.